Flynano - Businessangels.fi - muutakin kuin rahaa. Management Mikki Korhonen Chairman of the Board and CMO, branding wizard with awarded experience. Mika Suila CEO, international blue ocean strategist and experienced executor. Aki Suokas Member of the Board, Design Lead and CTO, aircraft R&D and aviation authority background. Kusti Kairikko Sales. Harri Heino Production and powertrain. Joonas Rajamäki Business controller. The Board and the mgmt team are developed further after first customer deliveries. We all have dreamt about flying! Many are continuously looking for new challenges and cool adventures. Flying hasn’t been that easy, adventurous or cool for a civilian. Aviation in general is heavily regulated and bureaucratic. The actual flying chances are often limited due to time, place and plane restrictions. Not all can keep their licenses e.g. due to common medical reasons like diabetes. Noisy, polluting planes are seen today as not-cool. 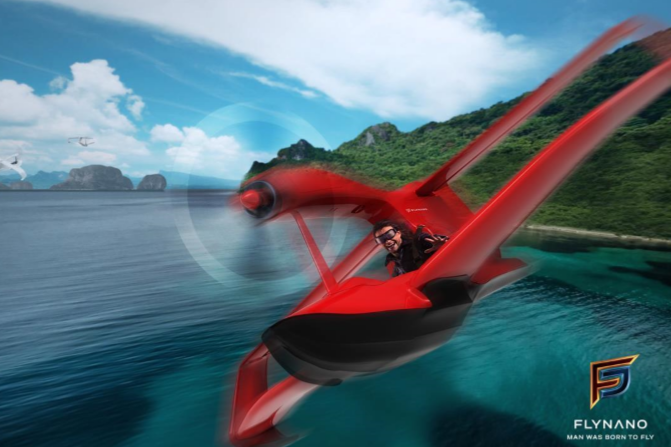 Company’s spearhead-product is an extremely light, yet real fixed-wing single-seat electric seaplane that doesn’t require a pilot license. Where there’s water, you can fly! Maintenance free. FlyNano specific trailer for an easy transport and storage. Accessories include extra batteries and chargers, HUD helmets, flying suits, life vests etc. FlyNano-branded lifestyle clothing and other merchandise. FlyNano Academy ensures required flying skills. FlyNanos are flown in good weather conditions. The open cockpit and the imminence of water mean that warmer air and water temperatures make flying more pleasant and fun. Main markets have warmer climates and plenty of seashores or inland waters (lakes or rivers) like Mediterranean, Middle East shores, Southeast Asia, Northern Oceania and MiddleAmerica. Warm summer season areas form also a large market, like southern and central Europe and USA. In its first phase the company is responsible for the concept and product development, production and quality management, marketing and sales. Production is outsourced. Later, as the partner network grows, the emphasis of the company is on the production, marketing, retail, training (FlyNano Academy) and servicing partner network management, global marketing and brand management and product development. Co-branding (FlyNano Air Races and events). The first targeted end user segments are pilots with valid or expired licenses (6M globally), pilot-trainees and other aviators without licenses (e.g. paraglider and hang glider pilots). As the adventure sports market is growing rapidly, persons interested in flying and adventurers looking for new experiences (30M+) will form the main end user base. Our new lifestyle brand will attract millionaires wanting to stand out with luxury gadgets (37M). FlyNano earned quickly media coverage up to 50 million viewers after the concept launch! The resulted overwhelming interest proved the clear bottled-up need for the product. Global product launch is held after first successful customer deliveries. Marketing emphasis is on earned and electrical (incl. social) media, trade shows and events (e.g. FlyNano Air Races). Local retail and marketing partners. FlyNano – cool and adventurous lifestyle brand! FlyNano creates a totally new aviation and adventure sports class. The main competition in aviation comes from ultralights. The open cockpit versions are slow and clumsy, and the flying feels more like “hanging in the air”. The closed cockpit of the faster aircrafts and their higher altitudes lessen the feeling of speed, and they need pilot licenses. FlyNano competes also with other motored and non-motored adventure and water sports and hobbies. FlyNano is the world’s first mass-producible powered fixed-wing aircraft that weights under 70 kg but still flies like Cessna! The key enablers are the sleek, unique design with a patented one-piece boxwing, advanced carbon fiber structure, electric powertrain with proprietary parts and with the best power to weight ratio in the market, and even the market’s lightest, tailored painting solution. This first mover creates new fun flying standards.